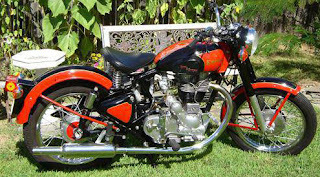 Has anyone seen this distinctive Royal Enfield? Ever wonder what ever happened to your first motorcycle? So has John, the one-time owner of a Royal Enfield in Sea Isle City, N.J. He advertised for news about it on CraigsList. Mind you, he doesn't necessarily want it back. He more or less just wants to know it found a good home. "I'm looking for a Royal Enfield Bullet 500 I sold back in 2004-2005," he wrote. "Can't remember exactly. I think I was trying to forget selling it. Not sure if I want to buy it back or just know how it's doing these days. I believe the buyer was from New Hope, Pa. area? "He bought it from me here in Sea Isle City, N.J.
"It was my first motorcycle and it has been coming up in conversations a lot lately. Please if you know it or bought it from me, give me a heads up... Thanks!"